Assembly Minority Leader Brian M. Kolb (R,C,I,Ref-Canandaigua), Assemblyman Phil Palmesano (R,C,I-Corning) and Sen. Pamela Helming (R-Canandaigua) called on Gov. Andrew Cuomo and other state officials to block a prospective application from Circular EnerG, LLC to construct a waste-to-energy incinerator at the former Seneca Army Depot in the Town of Romulus. A copy of the letter to the governor and state officials is attached. Not only would the incinerator generate unwanted pollution, but thousands of tons of municipal solid waste would be delivered to the site each day, creating an enormous amount of unacceptable traffic and wear-and-tear on local roads. 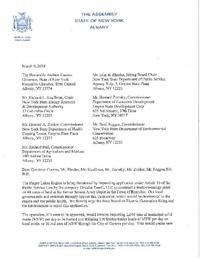 In a letter to the governor and state agency officials, the lawmakers pointed to overwhelming opposition to the project from residents, business and local officials as cause to deny Circular EnerG’s application before the State Board on Electric Generation Siting and the Environment. “Few, if any, areas of New York State are as dependent on vibrant natural resources as the Finger Lakes Region. Our unique natural landscape supports business and industry, helps drive our economy, brings visitors into the region, and allows residents to enjoy an exceptional quality of life,” the legislators conveyed to state officials. A Special Use Permit application before the Town of Romulus Planning Board has already been withdrawn. Local officials made clear the project is unwelcome, and as such, the lawmakers asked state officials to honor their wishes and block this project. “Being located only 3.9 miles from Seneca Lake and the Cayuga Shoreline, this operation would compromise the character and safety of the region for both residents and tourists and would result in devastating impacts that we simply cannot allow to occur,” the letter reads. “The families and businesses of the Finger Lakes applaud Minority Leader Brian Kolb, Assemblyman Phil Palmesano and Senator Pam Helming for taking a proactive stance against this garbage incinerator,” said Joseph Campbell, President of Seneca Lake Guardian.